Childhood cancer survivors have numerous risk factors for impaired bone accrual, muscle deficits, excess adiposity, and metabolic syndrome; however, the exact predisposing mechanisms are unknown. Adipocytes and osteoblasts share a common mesenchymal stem cell (MSC) precursor, and the Wnt/β-catenin signaling pathway (a target in cancer therapy) plays a critical role in MSC survival, commitment, differentiation and recovery. Therefore, cancer therapy likely impacts the preferential differentiation of adipogenic over osteogenic lineage following bone marrow injury. 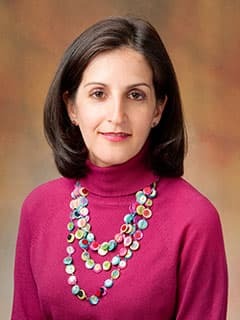 Researchers at the Center for Childhood Cancer Research, including Sogol Mostoufi-Moab, MD, MSCE are monitoring and tracking the short-term and long-term bone, body composition, and metabolic abnormalities following childhood HSCT. These studies highlight the impact of intense, multi-modal childhood cancer therapy (chemotherapy and radiation) on the developing skeleton as HSCT survivors demonstrate low trabecular bone mineral density, small cortical dimension, enhanced vertebral marrow adiposity, and abnormal bone micro-architecture years off therapy. The numerous identified vertebral deformities and compression fractures portend a life-long risk of fracture and frailty. In addition, the markedly increased whole body fat mass, preferential excess of visceral and intramuscular fat, decreased lean mass (consistent with sarcopenic obesity), and insulin resistance herald increased morbidity and mortality in this growing survivor population. The researchers goal is to eventually identify targeted interventions for future randomized clinical trials addressing these bone and metabolic abnormalities after successful childhood cancer therapy.